Join the local IFMGA mountain guide Hugo on this 5-day mountaineering trip and reach the summit of the Chopicalqui Peak. A really nice ascent in the heart of the Cordillera Blanca. Are you ready to ascend to the top of the Chopicalqui? It is the third highest peak of the Huascaran massif. I would like to invite you to this 5-day expedition which consists of conquering the summit of the Chopicalqui mountain. As you may know, it is located in the Cordillera Blanca, right next to the Nevado Huascarán, the highest peak in Peru. Once we reach the summit at 6,300 meters high, we will be in front of one of the best views of the Andes. Furthermore, the Chopicalqui is the fifth highest mountain in the province of Yungay and the fourth of the Cordillera Blanca. What you will see from such a viewpoint is really unforgettable! Our starting and ending spots will be in the city of Huaraz. During this adventure, I will guide only two people. That way I can offer you a personalized and safe experience. The best season to come to the Cordillera Blanca is from June to August. It is the driest period of the year in Perú. If you want to know more details about the day-by-day itinerary, you can find it at the end of this page. And if you would like to plan this trip with me, please fill out the form. Get in touch so we can discuss your wishes and expectations. I will be happy to guide you to the summit of the Chopicalqui. We will leave north from the city of Huaraz until arriving at the detour of the highway. There, we will pass through the the Huascaran National Park entrance, where the two beautiful lagoons of the Quebrada Llanganuco are located. Then, we will reach the crossing of the Quebrada Ancush and finally, the nevado Chopicalqui base camp. It will take around 4 hours by bus and 1 hour of hiking. Today will not be a very long day but it will involve a constant ascent by a zig zag path that will take us to the moraine camp. Here we will sep up the tents and enjoy an impressive view of the southwest face of the Chopicalqui. Walking time: 3 to 4 hours. We will pass the avalanche area very early, then follow the trail until reaching the Camp 1 at 5,500 meters of height. It will be a very short hike but with a fabulous view of the Neado Huascarán by the south east ridge. We can also admire the Huandoy and Pisco mountains. Walking time: 3 to 4 hours. Today is an important day. For that reason, we will leave at midnight to ascend to the top of the Nevado Chopicalqui. This will be a very long and tiring day but with a breathtaking view of the mountains of the Cordillera Blanca. Then we will descend by the same route, arriving at Camp 1 to disarm the tents and continue the descent to the moraine camp. Total hiking time: 10-12 hours. Today we will descend by the same route passing by the base camp and then we will get to the road where our bus awaits. Return to the city of Huaraz (3-hour drive). Walking time of the day: 3 hours. 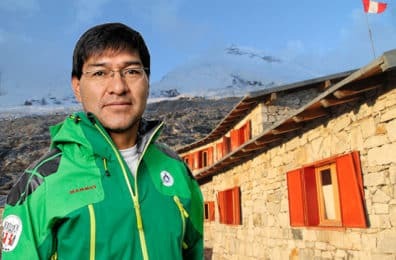 Edgar Hugo Sifuentes Maguiña Mountain Officer Guide AGMP - UIAGM (Operations Manager) trained as a Mountain Diploma Guide in 1992, with the Mountain Guides Association of Peru (AGMP), under the agreement between the Ministry of Tourism of Peru and COTESU (Swiss Technical Cooperation), in 1996 enters the table of Instructors of the AGMP to date. In 1999 the AGMP joined the UIAGM (International Union of Mountain Guides Associations) in which he is also a member, in 2001 he is President of the AGMP making substantial changes within the Institution.